Humans intrinsically seek convenience; our brains are biologically wired that way. So what if there’s a cool place that offers all the different and exciting adventures you want within walking distance from one another? Dream no more for there is such a convenient place—Danasan Eco Adventure Park. Let’s check out the park’s awesome activities that will surely satisfy your craving for excitement! Our first activity was also one of the most unusual. We wore safety helmets and harnesses to ride on—a bike? And it’s not a high-tech, super sleek bike. It’s one of those cute ones that you usually see in children’s books! One even has a small basket in front. They only lack those cute tassles tied on the handlebars! Well, we instantly found out why we need safety gear. 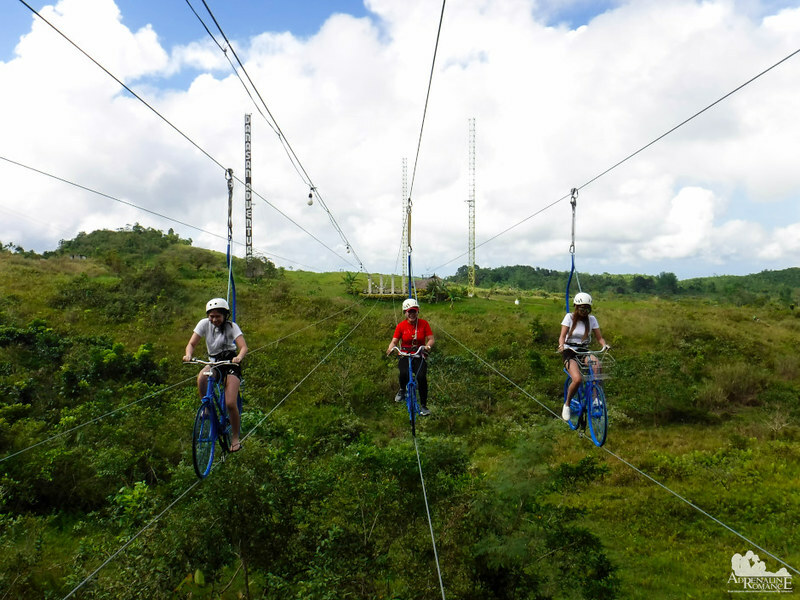 The Skybike adventure is similar to the ubiquitous zipline except that you are riding on a bicycle that is balanced on a steel cable! This should definitely test your balancing skills. 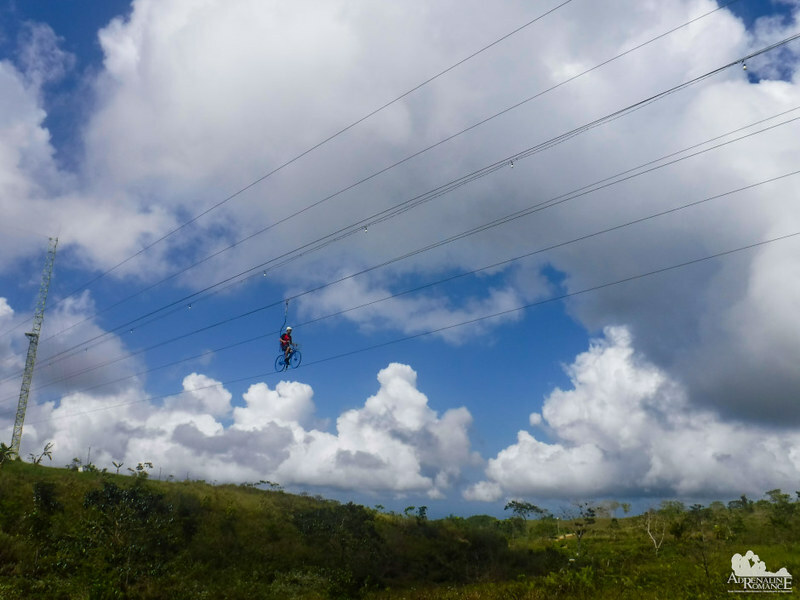 The bike zips down a 180-meter steel cable as it goes downhill. But to go back, you need to pedal to your starting point. Biking 40 feet off the ground on a slender steel cable? Why not? 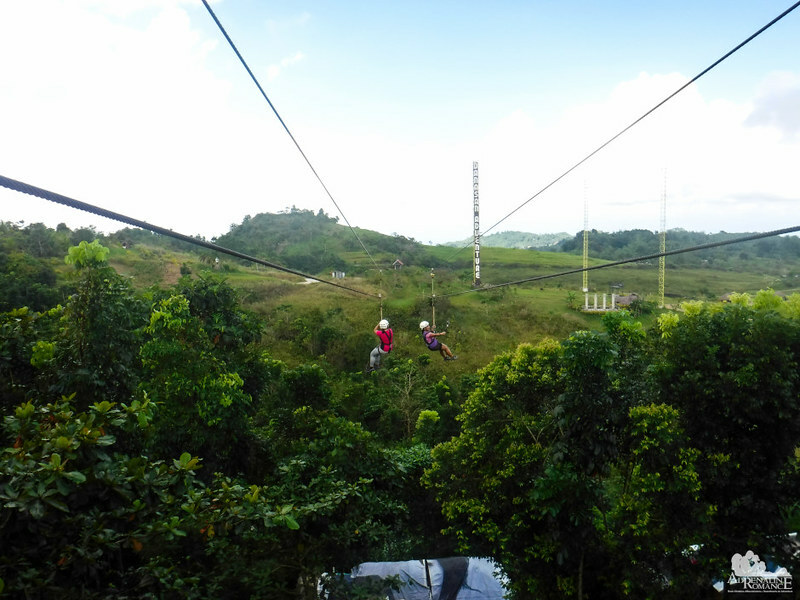 Of course, you definitely don’t want to miss out the zipline. The line is 440 meters long from one end to another, zipping you to a cruising speed of 50 kilometers per hour. You can hear the air whooshing as you zip by. 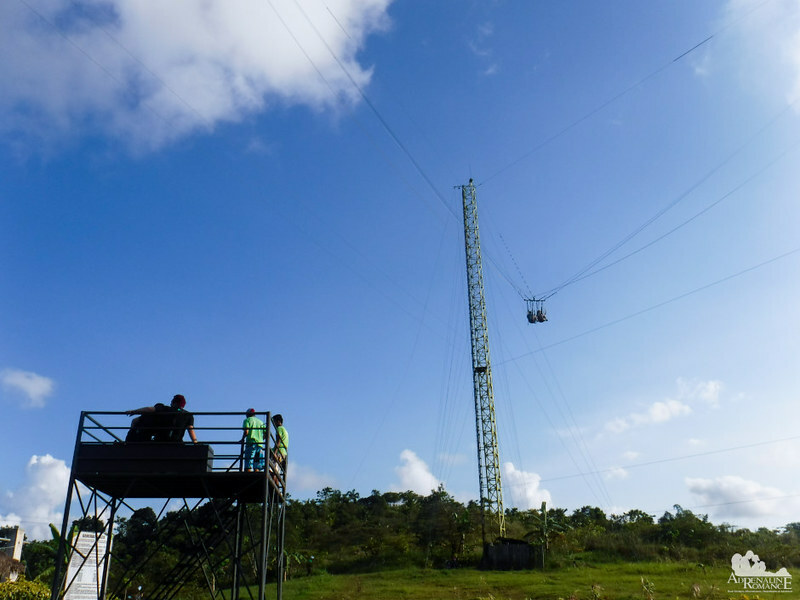 At the bottom of the zipline’s receiving tower are saddled horses that are ready to take you along for a ride. 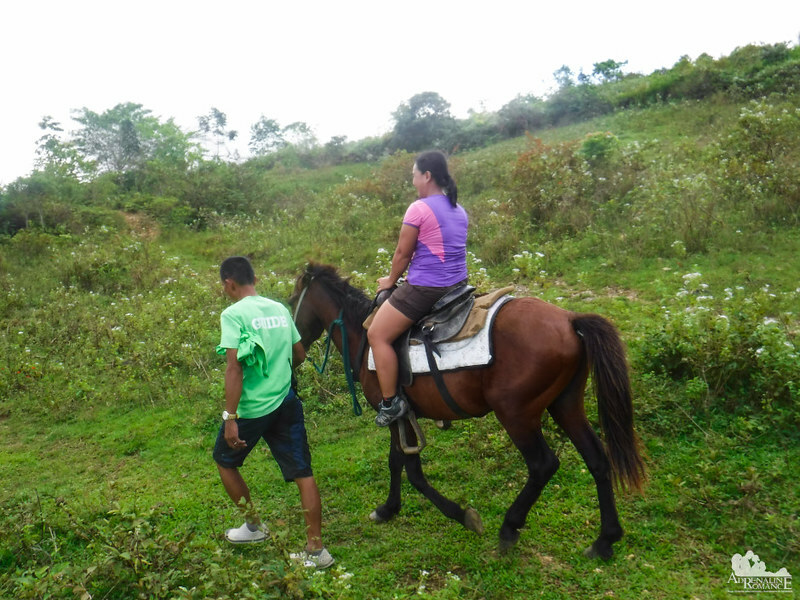 Like many horses we saw in Baguio and Vigan, Danasan’s horses are big, healthy, and muscular. It is obvious that they’re well taken care of. Safety tip: Always be visible for the horse. Do not go behind it because if it’s spooked, the animal may lash out with a strong and devastating kick. The horseback riding trail goes around the entire park. It passes along gentle hills, beside ponds, and between thick foliage. For safety, a guide holds the horse’s bridle as he walks beside you. Personally, I’ve always wanted to ride a horse myself. 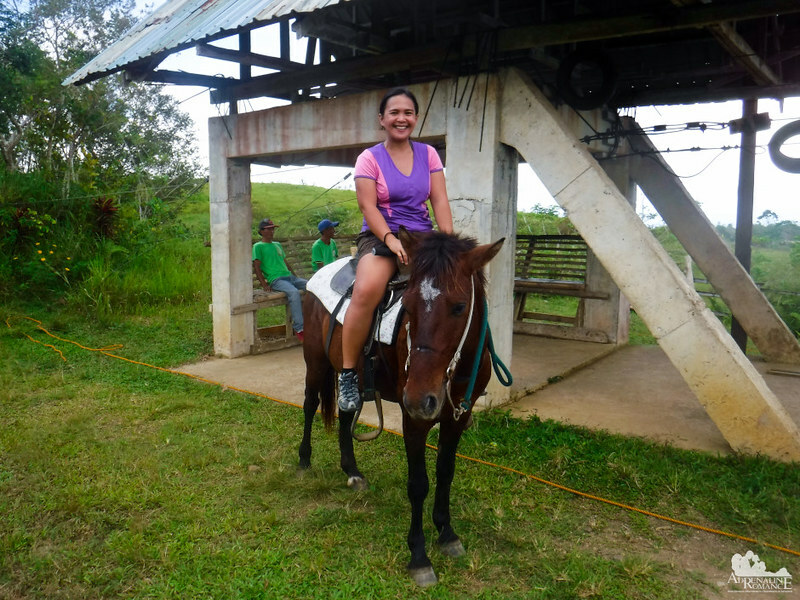 So I asked my guide for pointers on horseback riding. Then he let go of the bridle, giving me complete control of the horse. Oh yes, I felt like a cowboy! The centerpiece of Danasan Eco Adventure Park are three 120-foot steel towers that rise up from the clearing of a small hill. The towers form the foundation of one of the most exhilarating attractions of the park—the Skydrop. 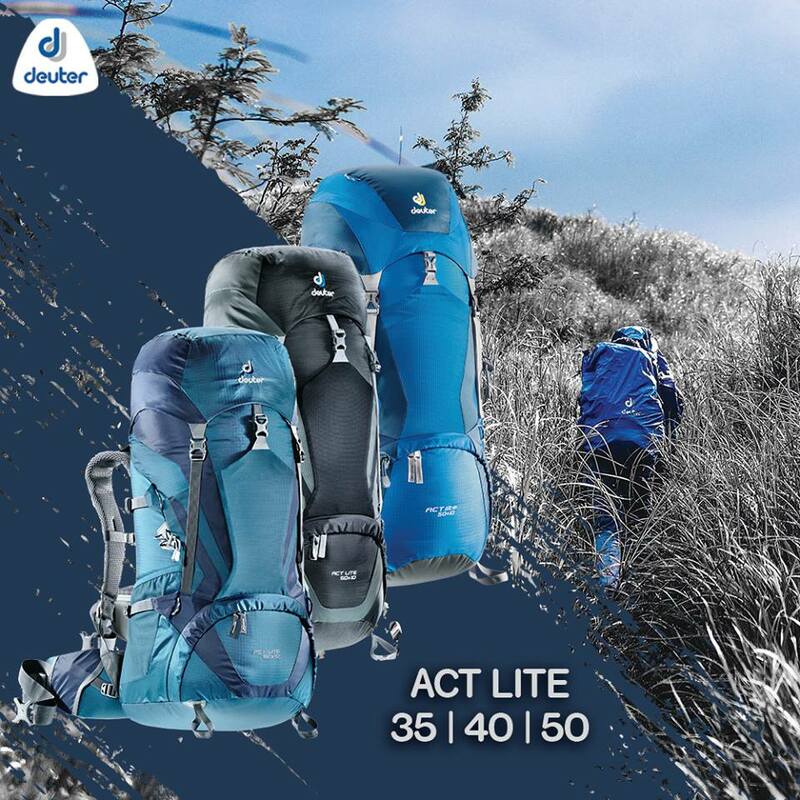 First, guides carefully secure you and a partner using an extensive network of safety straps and buckles. All set! As the staging platform rolls away, a machine slowly raises the riders to 120 feet. It takes a full 3 minutes for you to reach the top. As the device pulls you up to that top, you’ll definitely enjoy the countryside scenery of Danasan and the nearby municipality of Asturias. You can see the nearby Speedway and the ATV trail the higher you go. But utmost apprehension soon triumphs over relaxation. Feel your heart thump rapidly and the cold sweat stream over your body as one of you pulls down the release rope. When gravity takes over—-well, our expressions in the photo below say it all. Your soul will definitely say bye-bye as your physical body plummets down to the ground in a massive swing. We believe that a video would better explain this exhilaration and madness. Hahaha! 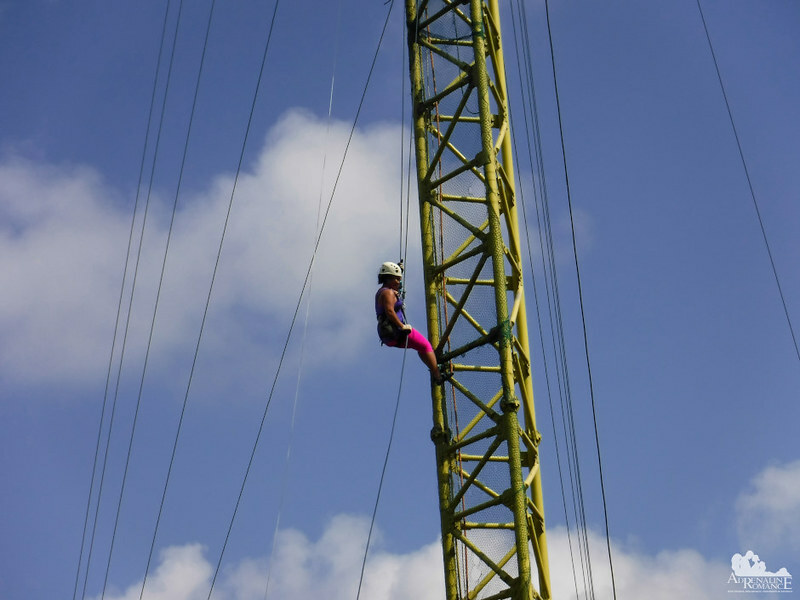 After recovering from your heart-stopping drop, you may feel you still need a dose of heights. 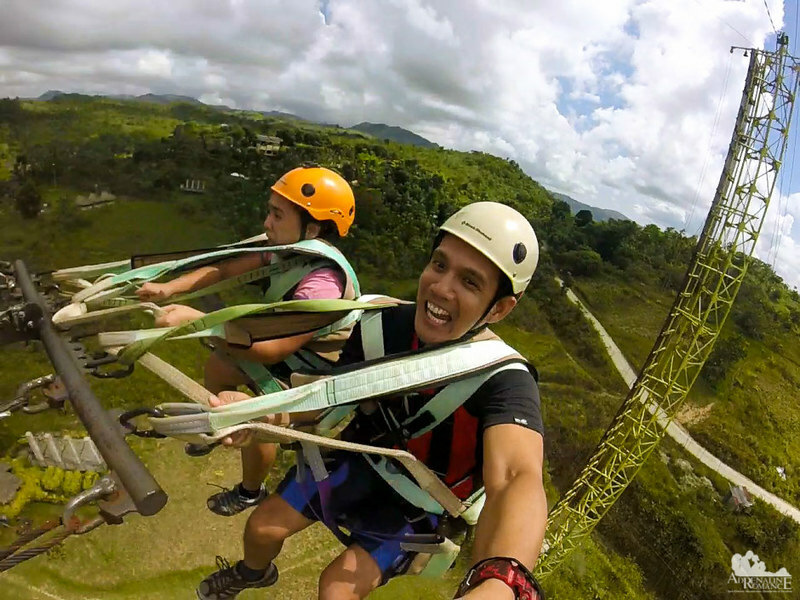 Don’t worry because Danasan has a penchant for such an adrenaline rush. 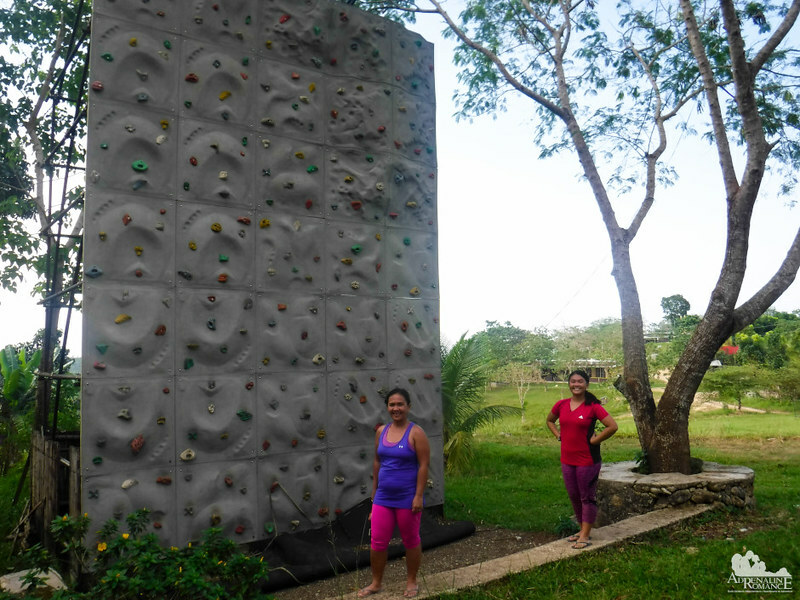 One of the towers is equipped with something that we truly love—an artificial wall! We donned on our rock climbing shoes and chalk bags and started to ascend the wall. You’ll have to bring your own—or you can go barefoot—because the park doesn’t have climbing shoes. Fortunately, the holds are quite large, so a pair of good-fitting rubber shoes is somewhat good enough. No need to worry about falling off the wall because the guides carefully belay you. This is definitely the highest climbing wall we have ever ascended. Most climbing walls we climbed top out at 40 to 60 feet. 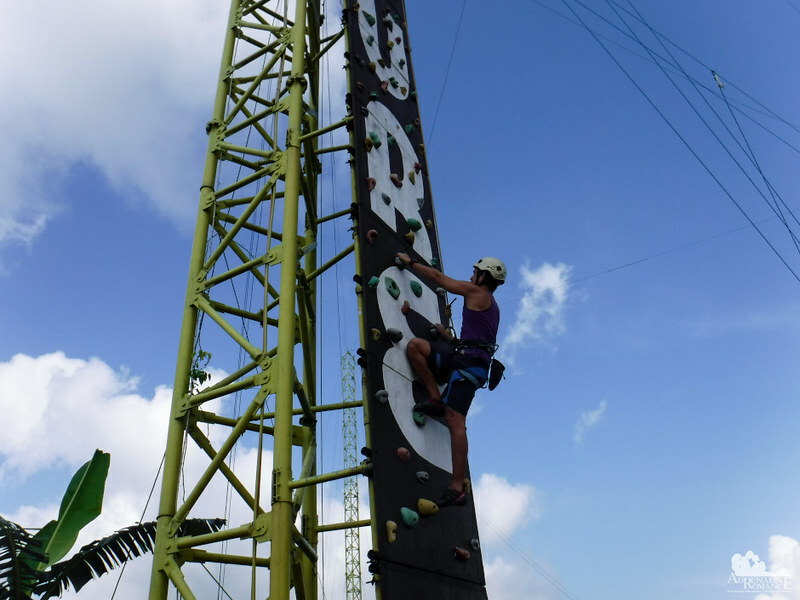 This one goes at 120 feet, and it was our first time to climb that high on an artificial wall! In fact, even though we know we’re safe, our knees still shook when we passed the midway point. You can stop at the 60-foot mark for the high cable traverse if you want. But the adventurer in you means that you want to push yourself past your fears. Despite being nervous, we were able to reach the top of the wall. There’s a nice bell that you can ring at the top. You can choose to go back to the ground. But if you still need some more in-the-air sensation, you can do the high cable traverse. 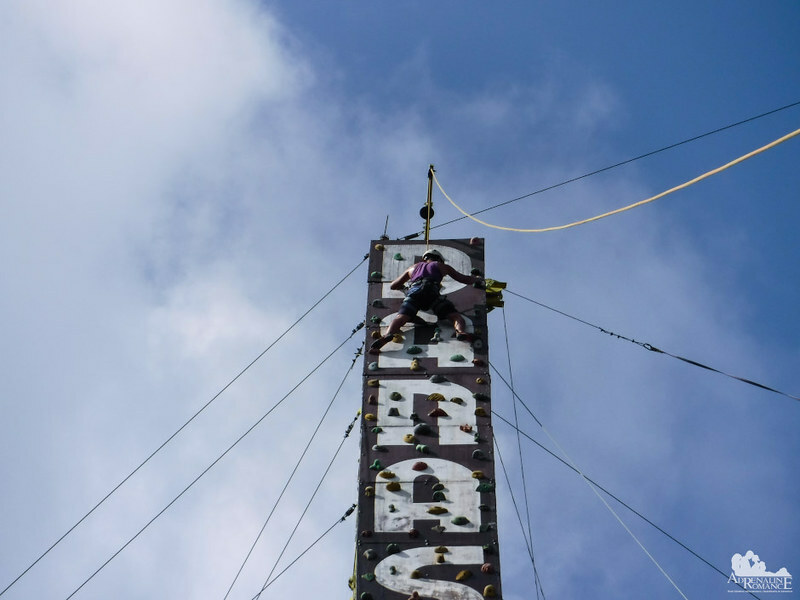 As you go down (or as you go up) the climbing wall, you stop at a platform 60 feet above the air on the tower. A guide helps set up your safety gear for the traverse. 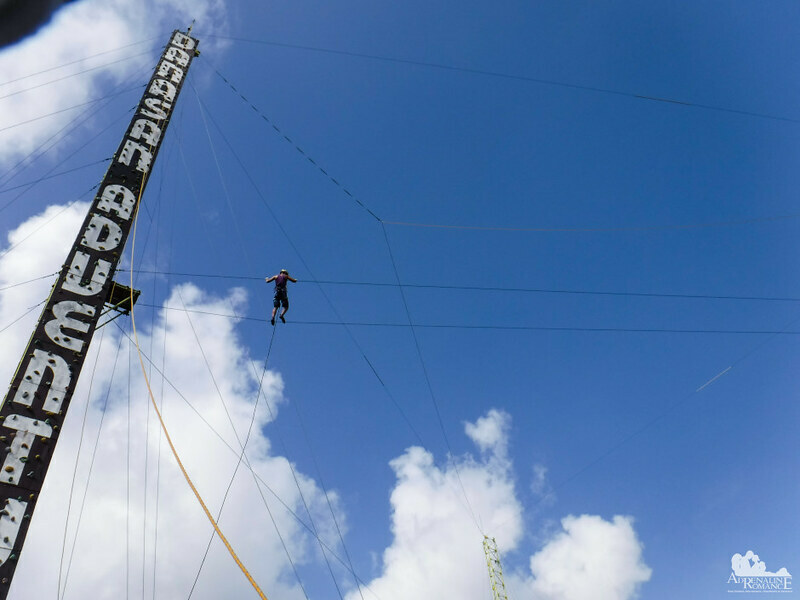 You cross from one tower to the other tower by shimmying over the high tension cables across the two structures. It’s better to shimmy than actually stepping on the cable to prevent the cable from shaking too much. Almost there! Each bounce, each movement of the cable sends jitters to everyone. Well, you’re 60 feet off the ground; survival instinct and the brain’s default safety function kicks in. But it’s definitely a fun, physical exercise! There is no other way down the tower except to rappel. For us, rappelling is absolutely fun! 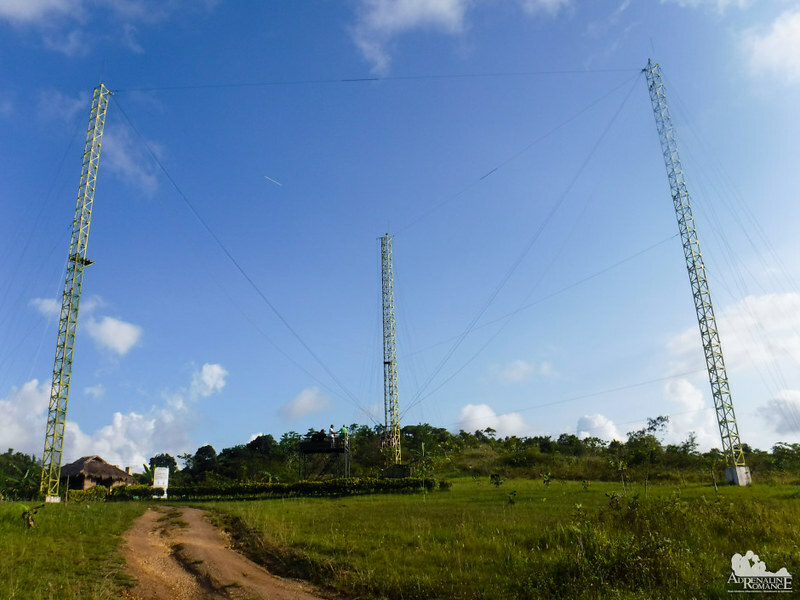 We wish there was another way to ascend the receiving tower so we could rappel over and over. Near the restaurant is a cool climbing wall for kids. It’s never too late to encourage young children to have a passion for climbing; after all, they have fun in climbing trees, drawers, cabinets, and more. Let them discover the excitement, happiness, and satisfaction in climbing. After being up in the air for so long, you might want to have a slight shift of preference—you would like to be on the ground. But then, there’s that nagging feeling to fulfill the need for speed. 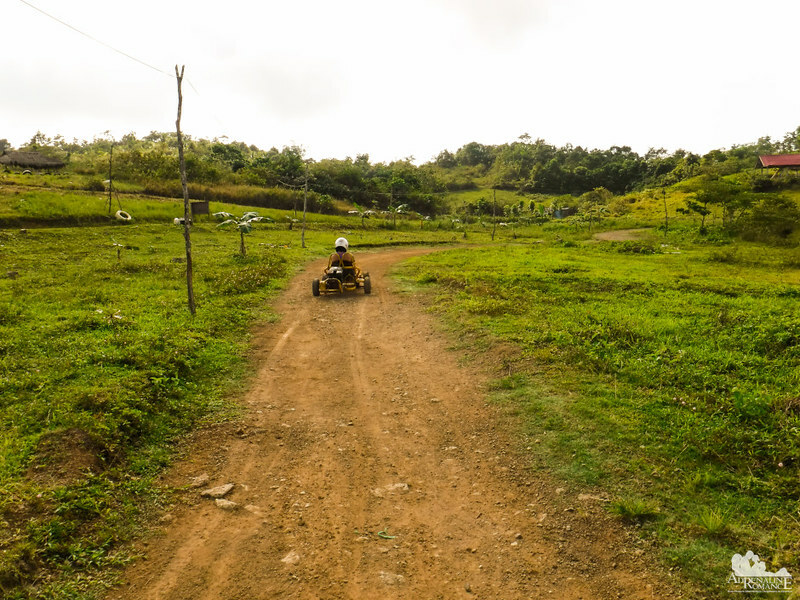 Well, head off to Danasan Eco Adventure Park’s Speedway! 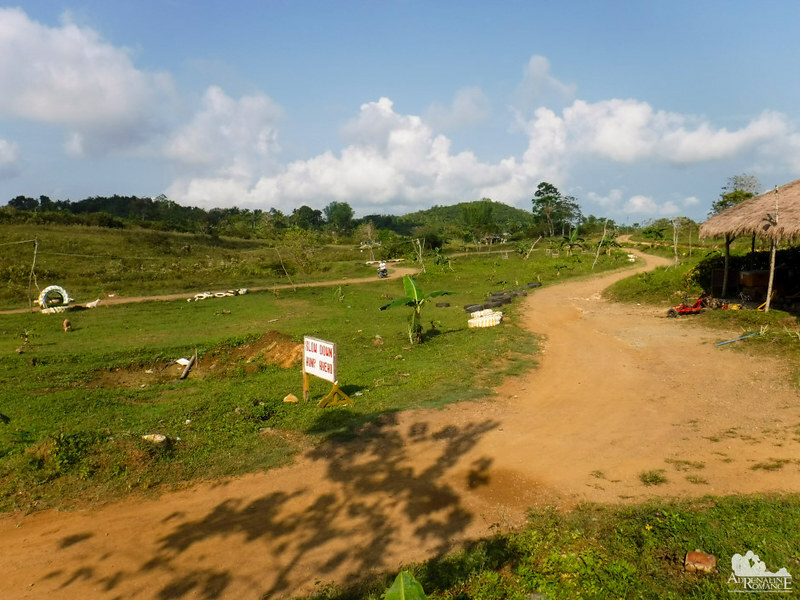 There’s a winding dirt-road Speedway where you can drive an off-road go-cart at full speed (just be careful). For safety, you are required to wear a full-face helmet as well as elbow and knee pads. A guide gives you tips on how to drive safely while reaping maximum fun. And it’s off to the racetrack! 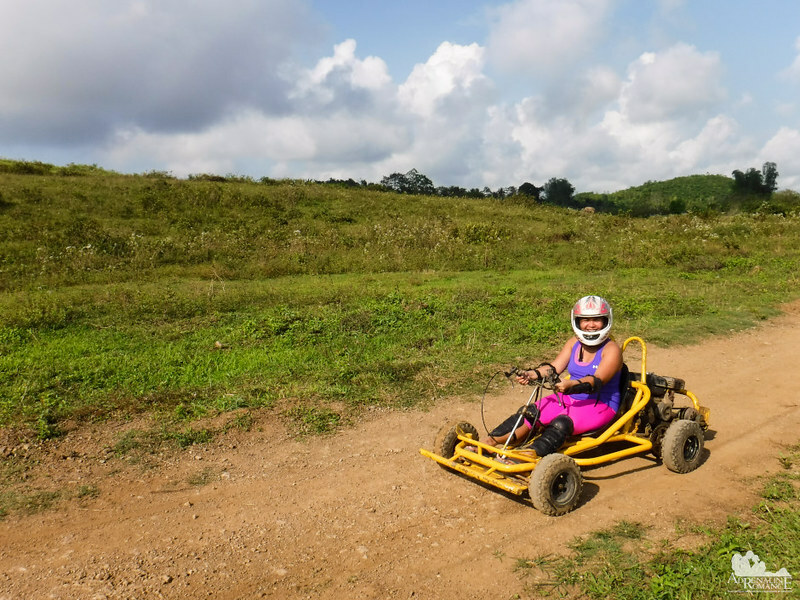 Sweetie, who has never driven a motorized vehicle due to a bit of fear, had the time of her life. “Why didn’t I do this before?” she asked herself. Well, regrets come later. But it’s a good thing that she discovered that driving a motor vehicle is not only easy but fun! Sometimes, you gotta set aside your apprehension and just actually do what you want. Often, you discover that what you had in your mind is way different than reality. She drove slowly at first but increased speed as she became used to the vehicle’s controls. She even asked the guide if she could do several laps down the speedway, which the guide happily obliged. We were the first ones using the Speedway that morning, so we had the track to ourselves. But it would be more fun if there were other guests with us so we can have a friendly race. Sweetie still couldn’t get over the excitement of driving an off-road vehicle. 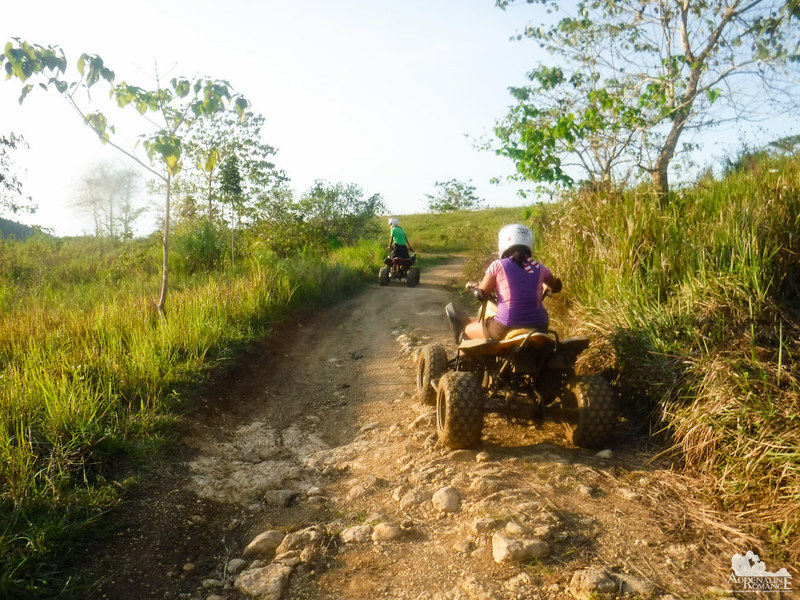 So later that afternoon, we decided to try out the powerful ATVs (all terrain vehicles). As usual, guests are given a safety briefing. Driving motorized recreational vehicles are fun but dangerous of you don’t follow safety protocols. Sweetie found out that riding an ATV is even more fun! We rumbled along the ATV trail that encompasses a big area of the park. The terrain has a variety of features—rocky patches, mud pools, humps, and more. 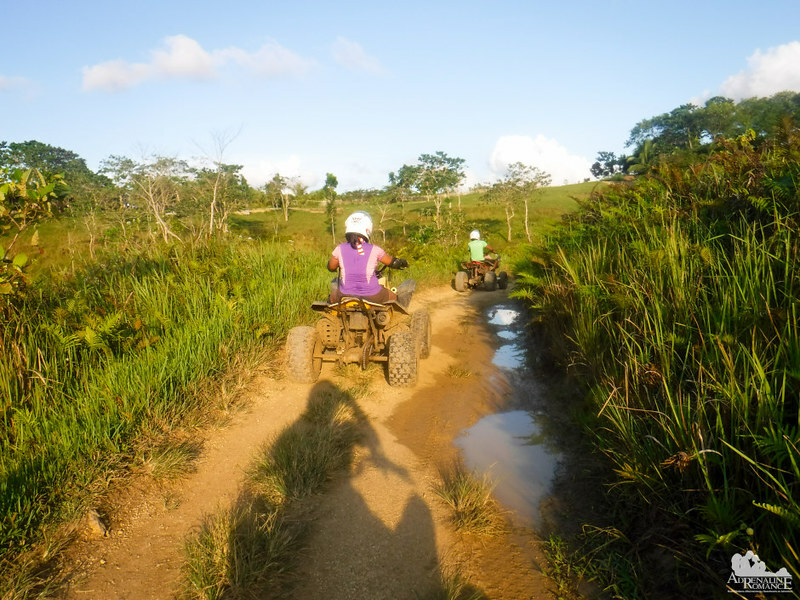 As you get more used to driving the ATV, you want to challenge yourself by riding over more challenging terrain and pushing the machine to your limits. I splashed over that muddy puddle. Mud splotches caked all over my shirt and shorts, but it was great fun! For nature lovers (that’s us! ), a day does not end without saying a silent goodbye to it. Good thing that the park has a great place to do that. 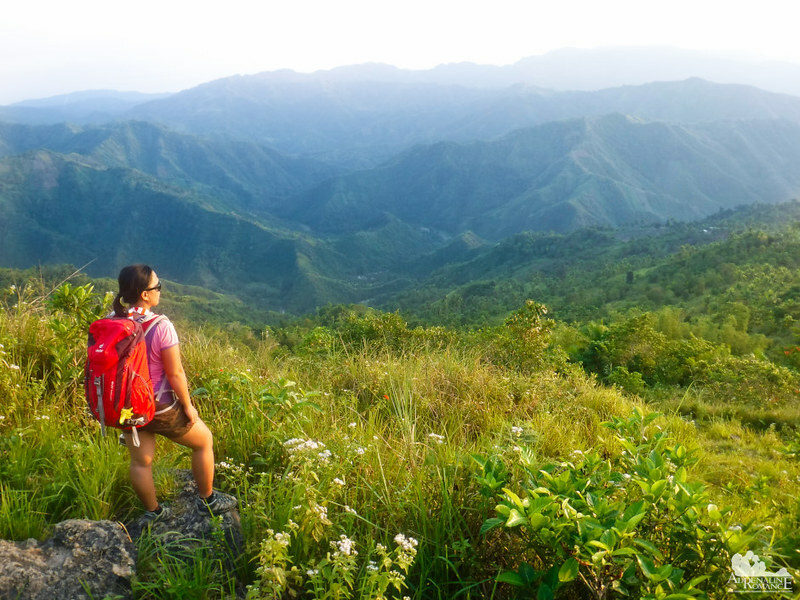 A well-established trail leads to a large hill called Danasan Peak. The hike is easy; grannies and children can do it. 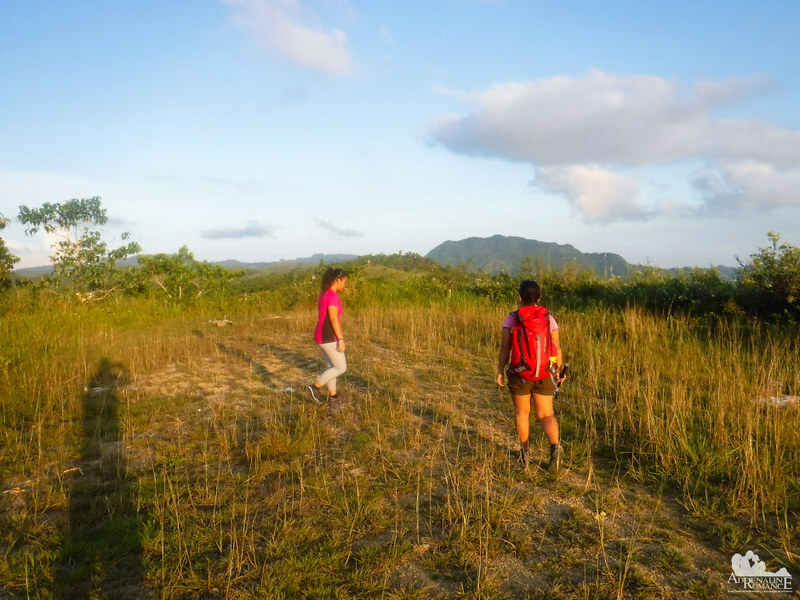 Within 15 minutes, you will arrive at the Danasan Peak, which is very flat and perfect for pitching tents. You can also see the entire park from the summit. One of the nice things about Danasan Peak is that the area is surrounded by thick bushes and foliage. Thus, campers are relatively protected from strong winds. 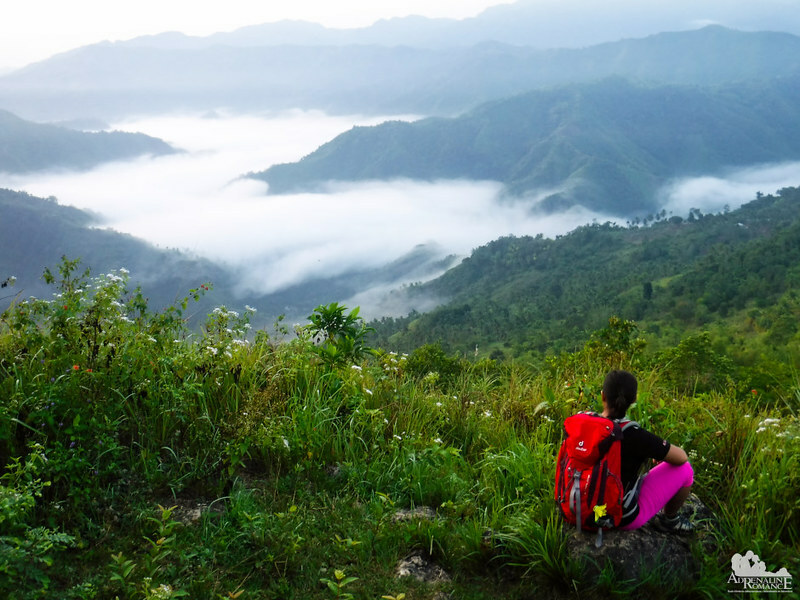 The view of Danao’s northwestern mountains on a glowing sunset is absolutely dazzling. We love how the soft glow of the setting sun bathes the landscape. 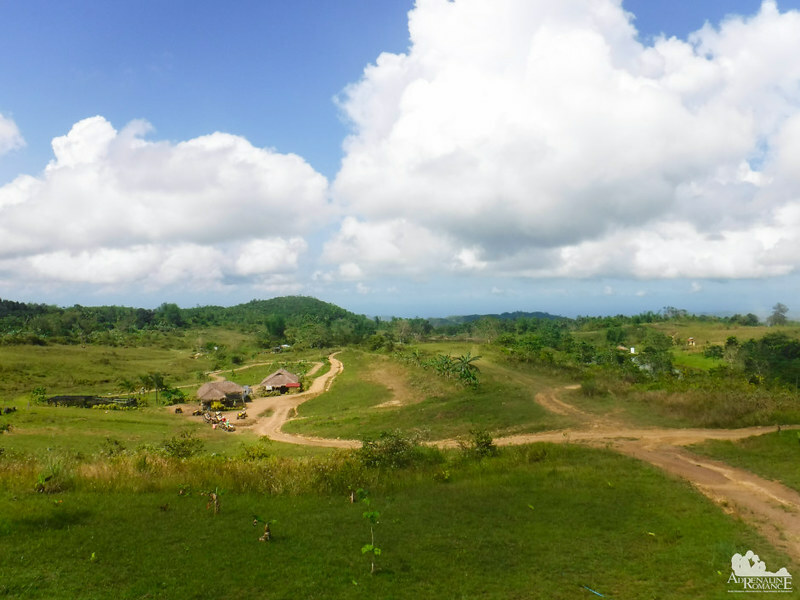 Many of us, especially locals, take Cebu for granted. But we have plenty of beautiful places in our humble island—places that need respect, appreciation, and introspection. Early the next day, we hiked back to Danasan Peak while the sky was still dark. We started early because we wanted to be in time to welcome the sun. What we found instead was not a fiery sunrise but an ethereal river of clouds nestled in the valley in front of us! We have seen seas of clouds in many of our climbs. But this was the first time we witnessed looking down at a river from the heavens! That was one heck of an adventure collection, isn’t it? 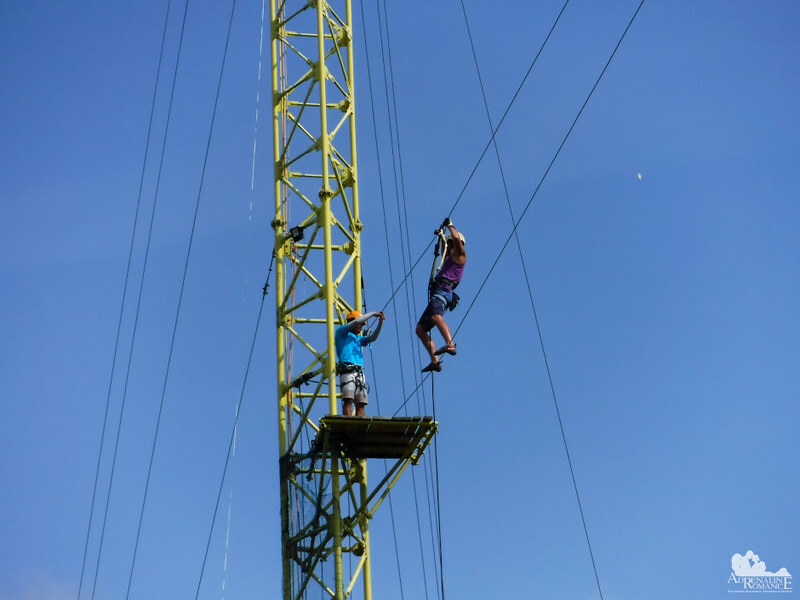 Danasan Eco Adventure Park has activities that will help you conquer your fear of heights, experience being suspended in the air, satisfy the need for speed, and commune with Nature. And you don’t need long flights, hikes, or road trips to do that. But wait! There’s more! What if you want a rawer, wet and wild adventure? Something that involves the real outdoors? Stay tuned for the next part of this series! 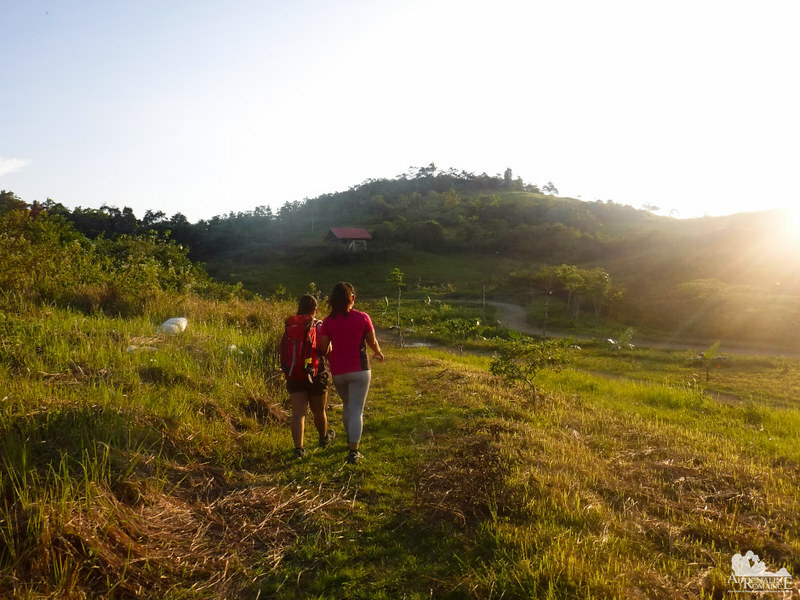 To get in touch with Danasan Eco Adventure Park, check out our Part 1 of this series. 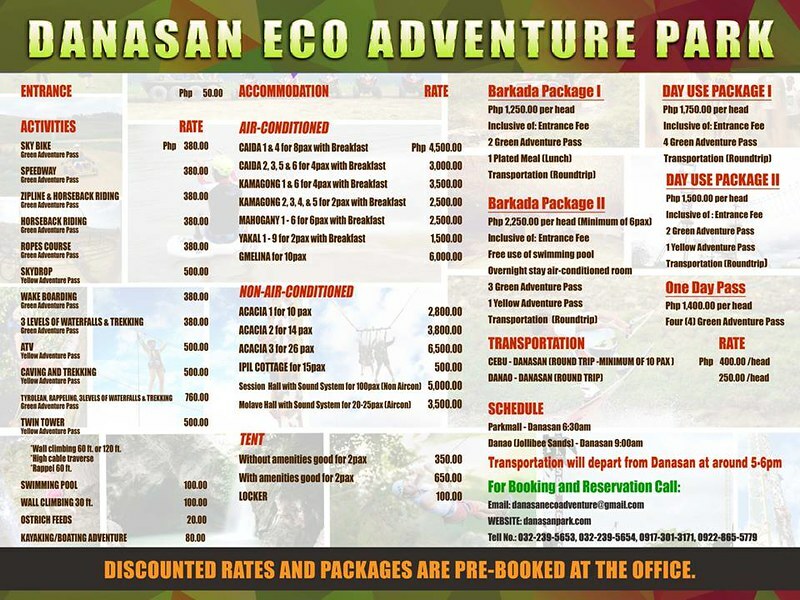 Refer to the photo below on Danasan Eco Adventure Park’s 2018 rates. *Rates are subject to change without prior notice. Get in touch with Danasan Eco Adventure Park for updates on rates, activities, booking schedules, and more. Wow, you are all so brave. LOL! The Skydrop was scary, but super exhilarating. The moment the system drops, it’s like our spirits are left up there. LOL! But yes, it’s really fun! 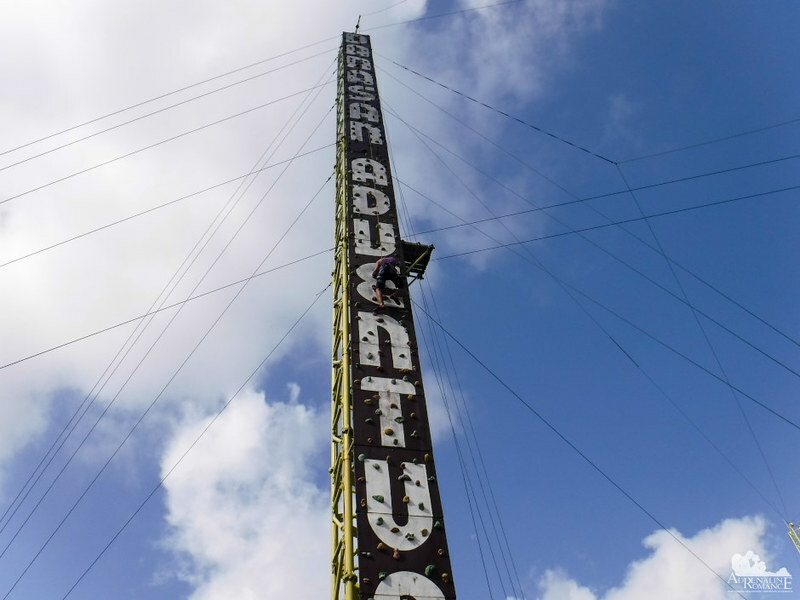 Did you try the tylorean traverse and waterfalls rappelling? Wow sky bike looks cool but scary! Hahaha! The Skydrop is scarier but more exhilarating. Hiking…yes, the rest….I may have a heart attack! You sure love to take your body over the limits 🙂 Great post and loving the photos. Hahaha! You can do all these. 🙂 Thank you very much for the compliment. Wow thats a paradise for activities. I would love to try skybiking. Me biking 40 feet off the ground on a slender steel cable? No can do 🙂 ATV on a mud track, maybe yes 🙂 🙂 But you seem to have had so much fun with all these super adventures. I will pass this on to someone I know who will really enjoy such activities. Hahaha! Don’t worry, it’s safe. You will be fastened to a harness and a safety cable. The skybike is awesome! I’ve never seen anything quite like it…very creative of them! Wow this park looks so much fun! I probably wouldn’t use all those attractions as I have terrible fear of height but this sky bikes looks pretty cool! I would be definetly up for that driving and hiking! Such a great place thanks for recommendation ! Oh wow! It seemed you had so much fun trying out Danasan’s variety of activities! I’d love to try out most of the activities that you did (atv, speedway and rappelling) except for the skydrop.. LOL. It looks super exhilarating! haha.. Too bad about the Skybike. I’ve been eyeing this particular when we visited Davao (at Eden Park) but did not get a chance to ride one because of the long queue. I don’t know how to ride a regular bike so this is one ride I’ll miss. The DanasanEco Adventure Park sure packs in a punch. So many adrenaline pumping activities at one place, a godsend for the people with an adventurous streak. I would personally fancy balancing myself on a bicycle high up in the air or challenge my fear of heights by scaling the high wall. It’s a great place for anyone who loves a dose of adventure. Haha! There’s no way to go off-course; you and the bike are tethered to a safety line. Anticipating the drop in the Skydrop is really scary. But the drop itself and the swing that follows the drop are exhilarating. The last time I came to visit was in 2012 and they have only a few activities which I also love at that time. Great to know that there are far more adventures this time. Oh yes! They are actually planning more activities like caving. 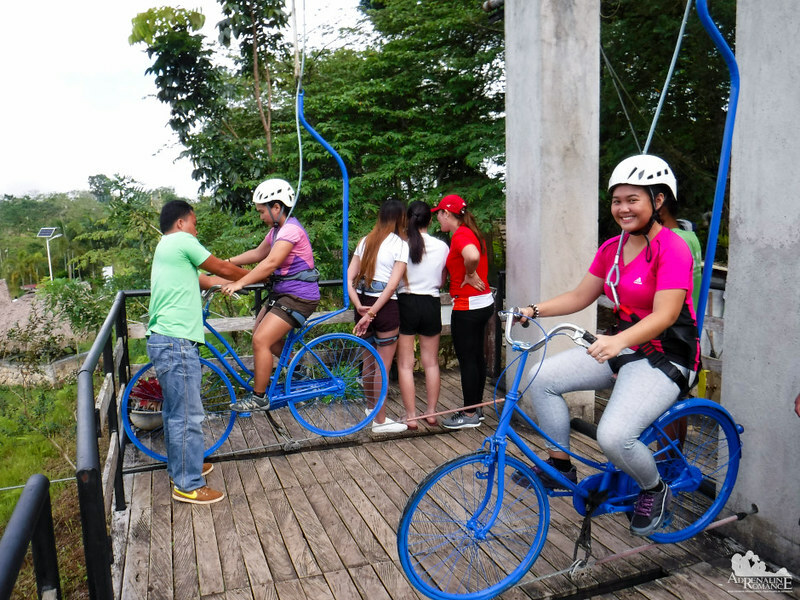 🙂 The Danasan Eco Park is a great place for families and friends who want to experience excitement and adventure!